Dena Bank Probationary Officers Recruitment 2017, Apply before May 9. Dena Bank 300 Probationary Officer Posts recruitment, Last date to apply Dena bank POs recruitment. 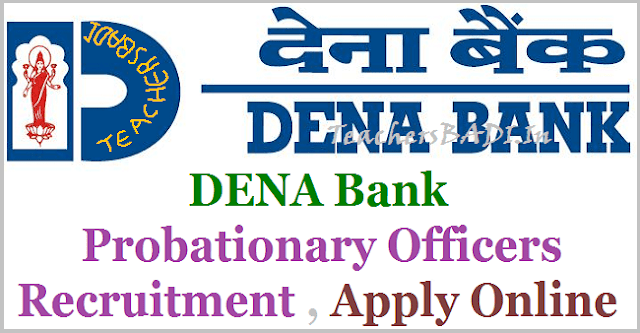 Dena Bank, Mumbai invites applications for the recruitment of Probationary Officer vacancies for Post Graduate Certificate in Banking and Finance course. A.Qualification:(As on 01/04/2017) Degree (Graduation) with minimum 60% (55% for SC/ST/PWD) marks in any discipline from a recognized University OR any equivalent qualification as such recognized by Central Government. B.Age Limit:(As on 01/04/2017) Minimum 20 years- Maximum 29 years i.e. A candidate must have been born not earlier than 01/04/1988 and not later than 01/04/1998 (both dates inclusive). Relaxation in Upper Age Limit as per govt rules. Candidates shall be selected by Dena Bank through a selection process consisting of an (open) online exam followed by Group Discussions and Interviews. The selection process aims at getting applicants who are likely to succeed at various roles in the Bank. The endeavour is to select people who are bright, have good communication skills (both oral and written), are dedicated, can work effectively in teams, are passionate about their career goals and who display integrity and a positive attitude. Minimum qualifying marks in group discussion and interview is 40 % (35% in case of SC/ST/OBC and Physically Handicapped candidates. Candidates are required to obtain a minimum score in each test and also a minimum total score in the online test to be shortlisted for Group Discussion & interview. Candidates will be shortlisted for Group Discussion & Interview depending on the number of vacancies, cut -off in each test and total marks secured in the online test as decided by the Bank There will be descriptive paper for test of writing skill in English which has to be completed in online mode only. The descriptive paper of only such candidates will be assessed who secure a minimum qualifying mark in the objective test. Wrong answers in objective test will attract negative marks (1/4th of marks assigned to that question) for the online test. Along with the call letters, information hand-out and a sample test shall also be uploaded on the site which candidates can take to familiarize themselves with the nature of Test & Questions. Group Discussion and Personal Interview: The aggregate marks of candidates qualifying in the Online Test will be arranged in descending order in each category and the candidates in the order of merit, subject to 4 times the number of intake in each category, will be called for Group Discussion and Interview. The qualifying marks in Group Discussion & Interview will be as decided by the Bank. The final merit list for selection will be on the basis of performance in Online Test (objective + descriptive), Group Discussion (GD) and Interview. Selection: Based on Online Examination, Group Discussion & Personal Interview. How to Apply: Through online mode. Candidates can apply online only from 18.04.2017 to 09.05.2017 through the link in the careers page of the Bank’s website www.denabank.co.in and no other mode of application will be accepted. Last date for Online Registration: 09.05.2017. Download of Call letter for Examination: After 30.05.2017. Date of Examination (Tentative): 11.06.2017.